(MPI) - This is the theme of the 2018 year-end Vietnam Business Forum (VBF), which is organized by the Ministry of Planning and Investment, in collaboration with the World Bank (WB), the International Finance Corporation (IFC) and Vietnam Business Forum Consortium, on December 4th, 2018, in Hanoi. Prime Minister Nguyen Xuan Phuc attended the Forum. Speaking at the opening of the Forum, Minister Nguyen Chi Dung said that a year ago, the 20th Vietnam Business Forum was held successfully, confirming encouraging achievements in the field of public-private dialogue, reinforcing the belief in a Government that is always accompanying enterprises, investors, and willing to listen, dialogue openly and straightforward on issues set out by the business community, and becoming a more and more role model, a good experience for countries that want to apply. Despite the rapidly and complicatedly changing context in the world and the region, which has a big impact on Vietnam’s economy, with efforts of the entire political system, along with the motto "discipline, integrity, action, creativity, effectivity", the Government has drastically directed and regulated all levels and branches to effectively implementing targeted tasks and solutions, focusing on solving difficulties, persisting on macroeconomic stability goals, creating positive changes in the economic restructuring, renovating the growth model, boosting administrative reformation, improving the investment and business environment, achieving the comprehensive results in all fields. Macro economy is stable, inflation is controlled below 4%, the expected economic growth rate of the year may reach 6.7% higher than the set out goals; the number of newly established enterprises is estimated at over 130 thousand; the total social investment is estimated at 1.89 trillion VND, in which, the private sector’s investment is increasingly growing, FDI disbursement is estimated at 18 billion USD; export reaches approximately 240 billion USD, etc. the domestic and foreign business community, investors have contributed significantly to achieving this significant result. However, Vietnam's economy is still facing many difficulties and challenges, the inflationary pressures are still high, the growth quality is improving step by step but still does not meet the demands, the labor productivity and competitiveness is still limited, the resilience of the economy to the outside fluctuations is low, the impact of climate-changing is growing, the risk of falling behind and the trapping of middle income still exists, etc. To overcome these remaining issues, the Government of Vietnam has determined to reform the economy comprehensively toward persisting the macro-economy stability and continuing to pursuing policies to promote fast and sustainable economic growth along with drastic implementing major breakthroughs, further promoting the renovation and enhancing quality of growth, labor productivity, competitiveness of the economy and synchronous development of capital markets, stock market, insurance market, real estate market, etc. At the same time, the Government will accelerate the speed of restructuring of the economy, restructuring the branches, fields, sectors, and industries of manufacture of goods attached with ensuring output market and synchronously developing the domestic and foreign market, researching active response solutions, reducing the negative impact of the world’s trade situation; drastically implement administrative reformation, judicial reformation, streamlining of the apparatus, organization, and payrolls associated with constructing a Tectonic State, an incorruptible, dynamic, creative, efficient and effective Government, improving the business and investment environment, creating an open, favorable environment for enterprises and people. 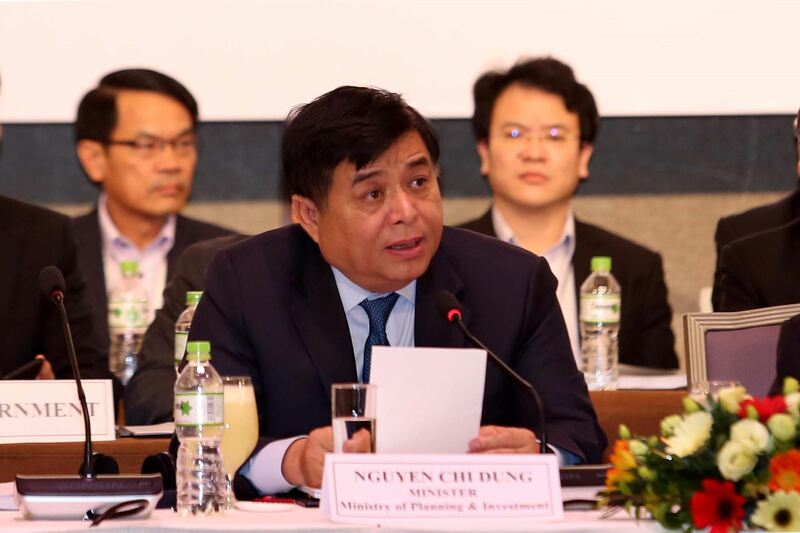 Minister Nguyen Chi Dung said that VBF has successfully fulfilled the role of transmitting difficulties and obstacles of the business community to Government’s agencies. In the coming time, the Government of Vietnam wishes the Forum to elevate its activity scope even further, promoting the spread of the Forum for the business community and investors to accompany the Government in advising, formulating important national policies, participating deeper in the debating, building and enforcing laws. Proposals of the business community at the Forum will contribute positively to the Government in implementing the socio-economic development goals, strongly improving the business and investment environment, enhancing the competitiveness, striving to be in the ASEAN's leading countries group soon, heading towards the standards of developed countries (OECD) and further elevating the international ranking of Vietnam; to strongly promoting innovation, initiative, start-up and development of enterprises; attracting foreign investment in a selective manner, prioritizing the use of the new, high and environmentally friendly technologies in association with the development of basic industries and support industries. VBF 2018 focuses on discussing a number of issues in which the business community takes interest such as solutions to further promote public-private partnerships, especially in the field of infrastructure; the complement of the system of education and training of human resources in the digital technology era; competitiveness enhancement to utilize free trade agreements; some petitions in the field of taxation and customs to create more favorable conditions for the development of enterprises, etc. The Forum would have three sessions and after each session, there would be feedback from the Government of Vietnam. Accordingly, in the first session with the theme of resources for infrastructure investment, the infrastructure working group would raise the issue of promoting public-private partnerships. The power and energy working group would present the reformation of the Direct Power Purchase Agreement (DPPA) and the Power Purchase Agreement with solvency - building feasible VIII electrical diagram. The capital markets working group would raise the issue of finance for the market and the theme of the banking working group is high-quality credit - an important resource for innovation. In the second session with the theme of improving knowledge to serve the modern industry, the education working group would raise the issue of new skills to meet the requirements of works in the 4.0 industry. The agriculture working group would present the precision agriculture and ways to advertise products in the world market. The tourism working group would present the issues of tourism - restaurants - hotels which need new approaches. In the third session with the theme of overcoming obstacles with business, the trade and investment working group would present the enhancement of competitiveness and reduction of the bureaucracy burden to utilize Free Trade Agreements and other trade opportunities. The customs and tax working groups would present the tax and customs transparency to facilitate conditions for the development of Vietnam’s enterprise./.